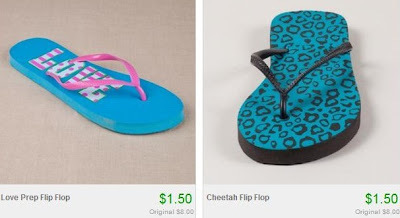 $1.50 Flip Flop Sale + Possible Free Shipping! Here's another awesome Totsy deal I have to let you all know about! Check out the Family Beach Shoes Blowout sale to find flip flops for only $1.50 a pair! Along with those, there's also water shoes starting at $2.25, wedge flip flops for $2.50 and many other types of shoes.